On the cover. The Knersvlakte is a small portion of Namaqualand somewhat inland of the western coast of South Africa. It is renowned for its quartz fields-plains of white quartzitic pebbles which blanket the surface of the earth like hail after a Midwestern thunderstorm. Within these fields grows a great diversity of dwarf flowering stones, especially leaf succulents of the Crassula and Mesemb families. The mesemb genera Argyroderma, Oophytum, and Dactylopsis are endemic to this area, growing exclusively on quartz. These miniatures often occur in such dense concentrations that they lend a green cast to the hillsides, growing shoulder to shoulder in carpet-like mats. As with many extremely arid regions, the Knersvlakte experiences great variability in rainfall, although the average is quite low. During the South African winter of 2001, unusually heavy rainfall saturated the ground and plumped the plants to the bursting point. 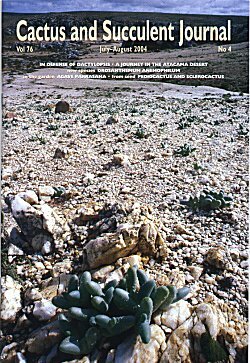 Rob Skillin shot the cover photo of Dactylopsis digitata in August of that year, when the plants were so turgid with water that the leaf tips of many were popping off from the internal pressure.